My personal story began in Joplin, Missouri, and has taken me around the world. My father was Boyce Bateman and my mother was Villa Roark Bateman. My father, the youngest of twelve siblings, was a World War I veteran. After Armistice in 1919, he trained to become an eye doctor. He was a traveling eye doctor, or (as we now call them) an optometrist.) Most of his work was done on the road rather than in an office. He met my mother in the farming community of Linwood, Texas and they married in that town. The couple moved to San Antonio, Texas, probably in late 1920 where they had their first home. My mother, Villa, responded to an advertisement in the newspaper for a sewing girl. A Design House managed by a Madam Meck placed the ad. Villa had sewn for her whole family of 7 siblings and liked it. She trained as a dress designer with Madam Meck in those early years of their marriage. Madam Meck soon recognized mother’s skills and talents, and taught her even finer skills as her protégée. Mother never used a pattern and could make any style of dress to fit any figure from a clipping or sketch. She sewed because she loved it, but the money she made was always welcome. From San Antonio, the couple moved to Joplin, Missouri. Boyce’s brother, M.B., had moved there and also was an optometrist. The two families were close as their children arrived. M.B. and Clara had 3 children. Boyce and Villa had one child, Anniedeen. I was born February 13, 1922. We lived in Joplin or nearby Springfield for the next 12 years. Mother took in sewing to “occupy” herself, even though my father always earned ample income—even through the Great Depression. As I grew, my talents in music and art became apparent, and, being an only child, opportunities for training were obtained in both areas. When I was five years old, a woman knocked on our door and asked Mother, “Are you Anniedeen’s mother?” She told my mother that I had been “taking piano lessons” by climbing on the piano bench with her daughter during her own lessons. She suggested that I be given piano lessons. My first piano recital was while I was five years old. I have been able to read music since before I started school. My teacher soon discovered I had “perfect pitch”—such a good ear for music that I simply recognized the note wherever I heard it. I also discovered I could draw anything that I could see. Mother got me art supplies and an art teacher, and I haven’t stopped from then to now. Watercolor painting is a great joy even in my 90’s!! Art has been my profession all these years. I’m still teaching it at age 92. My mother and father divorced due to his abuse and alcoholism when I was about 12. We moved to Alto, Texas, where Mother had inherited a farm from her father, Walter J. Roark, at his death. Momma started a Burial Dress business to support us as we had no support from my father. She bought crepes and laces and made an assortment of very pretty dresses—open down the back. My Aunt Annie, Mother’s sister, went with us and we took the dresses around the countryside to funeral homes where she quickly sold them all. Fairly soon, individual women discovered her talent and she had all she could do without the travel of the Burial Dress business. As a matter of fact, she put me through college at Stephen F. Austin in Nacogdoches, TX (1939-1943,) and I came out with no student loans! Debt free! ---due to mother’s sewing. Mother had clientele up to the time of her death—just before her 80th birthday in the fall of 1970. She died of pneumonia. She was with me in Baytown although she still had her home in Alto, TX. She is buried in the Old Palestine Baptist Church Cemetery in Alto, TX. 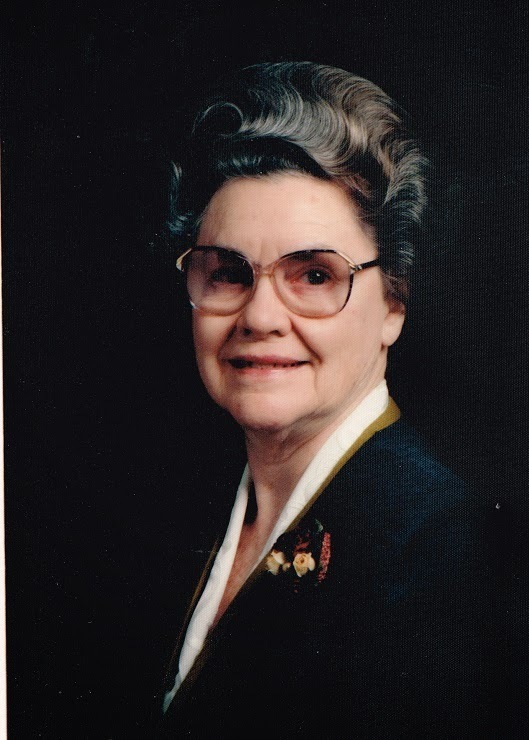 My mother was a good businesswoman—a remarkably level headed and good person. She had great faith in God and had received the Holy Ghost as an 18 year old girl in the spring of 1909. Harvey Shearer brought the Pentecostal message to her community. Mother’s staunch Baptist family, together with 100 other Baptists, were excommunicated from the church because of their new Pentecostal experience and beliefs. Due to this, the people built their own Pentecostal church, and this was the beginning of the formation of the United Pentecostal Church in Alto, TX. My majors in college were art and music. I received my Bachelors Degree at Stephen F. Austin at age 20 and Masters Degree at age 25 from Texas State College for Women, now Texas Women’s University. I taught Music in Anahuac, Texas, for 2 years, then Art in elementary school in Conroe, Texas, the next 3 yrs. In 1947 I had an opportunity to teach Art at Baytown Junior High. World War II was now over, and the economy was booming—especially in Baytown, where houses and apartments for rent were scarce. Nevertheless, my new principal assured me that the school system would “see to it that I had a place to live” before I would sign the contract. By mid summer we had heard nothing of a place to live, and Mother and I went home to Alto. Then my mother, a woman of great faith, said, “We need to go to Baytown.” We drove to the school and then started down a street leading from it. We passed what appeared to be an empty house. Mother said, “Stop. Go ask a neighbor about that house.” We were told that the people had moved out, and the landlord lived in another town. They gave us his phone number. Upon calling him, he told us he did not know the renters had moved and consented to rent to us on the spot. We had a house to rent within walking distance of the school! So, in September of 1947, we moved to Baytown, TX. The principal was pretty surprised!! They did not have a place for me to live, but GOD had provided—as He has done so many times in my long life! Thank You, Jesus. This was the beginning of close family friendships—which eventually resulted in true family relationships. The Creel family eventually became my own family. I married Lemuel Creel in November. 1963. He had been widowed, and his four children became my children. Lemuel and I had one child together, Rocky, born in August. 1965. God had answered another prayer of mine: to have a Christian family. In 1971, Lemuel, Rocky and I moved to Casper, Wyoming. Lemuel had been voted in as pastor of the United Pentecostal Church there. We pastored that church for 17 years until his passing in August of 1989. We had 26 happy years together. We had both planned to retire (from teaching and pastoring) and go teach in foreign Bible Schools. Though Lemuel did not get to live that dream, I eventually was able to carry it out. In 1993 I received an invitation from Bro. Stanley Scism, Foreign Missions Director of the United Pentecostal Church, International, to teach in the Bible School in New Delhi, India. I went through the A.I.M program and taught for 15 years—12 years in New Delhi and 3 years in Sri Lanka. At the end of that time, I came home to Casper, sold our home, and in May of 2009, moved to Conroe, Texas, close to family and friends. I now teach Art/Watercolor classes and Search For Truth Bible studies to those interested in the apartments where I live. I have met new wonderful friends and have seen 5 people in the Bible study group come to my church (Bethel Tabernacle) and be baptized!! I feel like I have come “full circle”---where my Art teaching career began many years ago.